I struggled to decide to put up as today’s Monday Mantra. To be honest, I had a few ideas but none o them really felt right today. I think that’s because sometimes, no words are better. We’ve gotten use to constantly listening to music, watching video’s, the TV and talking on the phone and that’s just in the commute, let alone at home or at work. When you think about it, a comfortable silence between friends or lovers can be quite comforting. Sometimes that wave from across the street can feel better than a five-minute conversation and do you remember that feeling when you lock eyes with someone from across the room, you get that zing of attraction and it’s like the entire world around you fades into the background? So much better than words, right?! 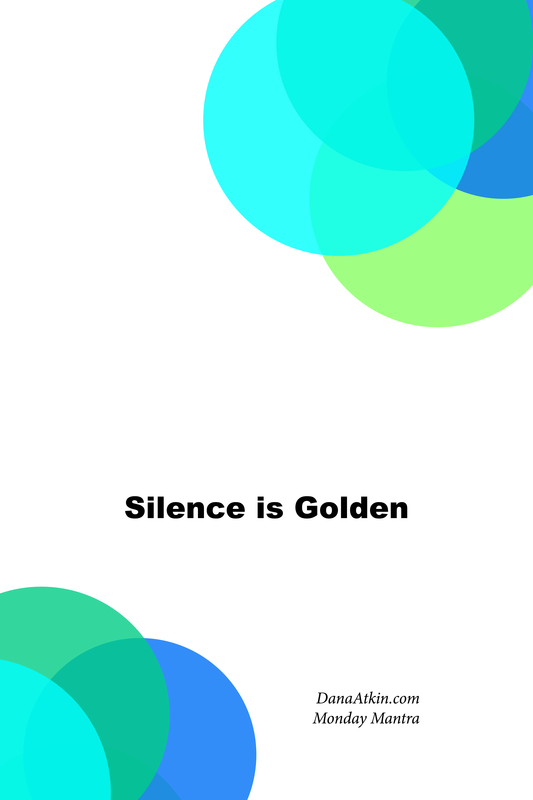 So, this week, choose to see silence as golden. Take in the sights, aromas and feelings instead. See and feel how rich life can be without words. Immerse yourself in the silence – Silence is golden. As always, save the full image to your phone home screen, your desktop or print it and pin it somewhere you’ll see it often. When you see it, say it. And if you think someone else would benefit from this mantra, share it.